A trumpet vase is one of the many vase styles available in home decor shops and garden stores. Putting flowers in a trumpet vase requires more than just sticking them inside in a haphazard fashion. Proper attention should be paid to the flowers' height to ensure your flowers look proportionate to the trumpet vase's height and that the final arrangement doesn't appear sparse or thin. With these considerations in mind, you can choose from a variety of flowers to fill your trumpet vase. Complementary colors often work well in such arrangements. Measure the trumpet vase's height using a ruler. This measurement will be important in determining the right height for the flowers you choose to place in the vase. Fill the trumpet vase half way with fresh water. Room temperature water is the best choice for most cut flowers. Select the flowers that you want as the centerpiece in the trumpet vase. Measure each flower from the bottom of its stem to the top of its blossom. The total height should be proportionate to the vase's height, or approximately 150 to 175 percent of the vase's height. Trim the stem appropriately if needed. Hold the cut flowers against the outside of the vase. Note where the vase's halfway line lies on the flower stem, which is how high the water is inside the vase. Trim away any flower foliage that would be underwater, and insert the flowers into the trumpet vase. Choose flowers to go around the central flowers. 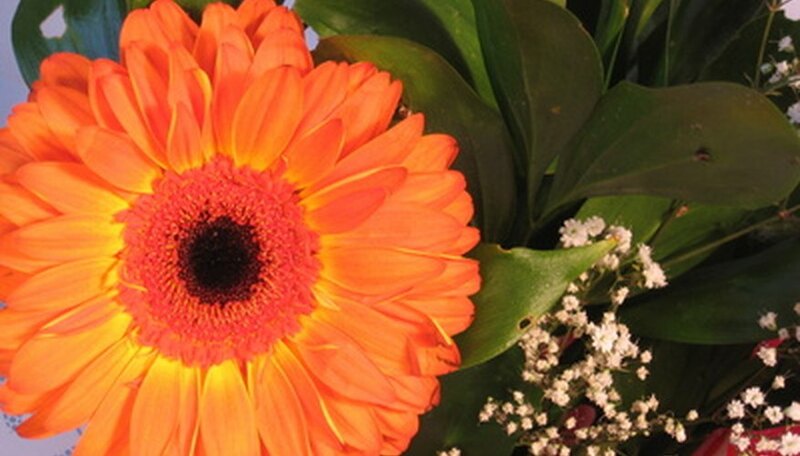 These new flowers should complement the original flowers' color and shape. Trim these flowers approximately 3 to 4 inches shorter than the first flower group, and insert them around the first group to create a lush and filled-in look. Remove all of the flowers once a day and empty out the water. Refill the vase with fresh water before returning the flowers to their original arrangement. Complementary colors are colors that lie opposite each other on the color wheel. For example, yellow flowers complement blue flowers. The trumpet vase's flared mouth presents several opportunities for creativity. You can stick with all upright flowers to contrast with the wide mouth of the vase. Or you can add trailing or bushy flowers like lobelia or scaevola around the edges to build on the vase's wide top.